Finding the right hair removal option for your specific situation can be a challenge. That’s because you have your own unique skin type, as well as hair type. It also makes a difference which area of the body you want to treat, and how thick the coverage is. The first thing you should consider is where the hair is located. If it has a large surface area, you’ll need to choose a method that can handle it. Some products are best suited for smaller regions and can’t handle big jobs. Next, think about how often you’ll have to keep up with maintenance. IF the area is awkward, or hard to reach you probably want something with longer lasting results, or even a permanent fix. We’ve assessed the situation and brought together the reviews that we’ve done on different hair removal options. They’re condensed for you here so that you can get a quick idea of what’s available, and then delve further into the ones that interest you most. 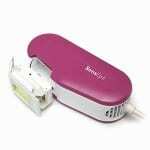 When you consider what the SensEpil is, an at-home laser hair removal system, it’s pretty impressive. For years now the only real way to get a treatment done was to go into a clinic and have a pro do it for you. This way you were at the mercy of whatever they charged and would have to go back for as many treatments as it took. With this you are in control of where you use it, when, and you don’t have to worry about how many treatments it takes because it’s just a one-off cost. You also get to use it in the comfort and privacy of your home which is great. No No gets a lot of hype assist from their 30 minute long infomercials that are designed to look like a talk show where women are praising its effectiveness. Pulling back the veil of hype is not easy to do, but when you see what real, unpaid users are saying about it, the verdict is that this doesn’t work. If the reviews were only mixed, we’d give it a try rating, but with so many people saying it doesn’t work, or if it shows results they’re nothing as described in the promos. We’re giving this one the no go. This is one option you have for a do it yourself light pulse removal system. The overall verdict is that this works, but there are a few drawbacks to it. 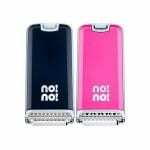 The first is that it isn’t painless, which few hair removal methods truly are. The second is that you’ll need to replace the bulbs it uses. Overall, this would be one that you could try out, because it’s not too expensive compared to the alternatives, and even considering the maintenance costs. And the pain involved is not as painful as getting a waxing done, so it’s all relative. 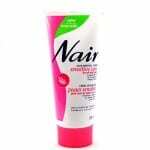 Nair has been around for ages, and it generally thought of as something that works for some but not for others. They’re branching out into the male market now, trying to get guys to use it on things like their backs. There are also special formulations for the face and the bikini zone. It’s nice to see that they’ve expanded from just being a cream you can use for your legs. The mixed reviews it gets makes it something you can try, but with reasonable expectations. The price makes it so you can try it out and not be devastated if you don’t get the results you wanted. The biggest problem you run into with many depilitory creams is that they can burn if you leave them on too long. 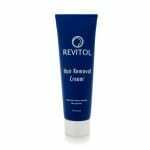 With Revitol, you don’t get that burning sensation, so you can leave it on longer for better results. They say in their promos that it works instantly, but real world testing says that this isn’t the case. The best tip out there is to leave this on longer than the directions say, since it’s not painful to do so. This gives it time to be more effective, and that’s where the positive reviews seem to be coming from. Laser hair removal sounds like a great idea because of the permanent results it promises. But even within the industry they are careful to use the word “removal” and opt for things like “reduction” instead. This is because too many people complained that the hair is still there, even after several treatments, or that it eventually grows back. There are those that say it works great, and it really depends on how advanced the treatment system is, and which part of the body you’re trying to remove hair from. At this price, it’s a hit or miss game that not many are willing to play. Since there are so many different goals people have, we’ve broken things down into different categories here to try and steer you in the right direction based on what your end game is. The right tool for the right job is a good quote to keep in mind, since you don’t want to use a facial hair remover for your back, or vice versa. Men are wanting to get their hair removed more and more, and the biggest request is the back. The second most requested area is the chest. These are two pretty large areas to try and treat, so you’ll want to go with a method that can cover them properly. Most guys would prefer a laser treatment on their back, because it’s such a hard area to reach, and there likely won’t come a time when they’ll want their back hair back. Waxing is not really an option for these areas because it hurts a lot, can upset sensitive skin, and the hair will just grow back in time any way. The chest is something you have more options with because it’s much easier to reach. You can either keep it trimmed with something like a beard or hair trimmer, or elect to shave it off. You might actually want your chest hair one day, so lasering it off might not be the best option. The most common areas that women want to treat are their faces, which we cover below. Next is the neckline and breasts. These areas are usually rather easy to treat, because they typically only have a little bit of growth, so they can either be spot treated with laser removal, or you can use a depilatory cream, or even wax them. The legs are not as common as you might think, as most women have come to terms with shaving their legs on a regular basis. This is a rather sensitive area, both literally and figuratively. You need to be gentle as not to irritate the tender areas, but effective enough to get the hair off. The most common method is to get a waxing treatment, but more and more women are opting to go for laser treatment as it provides the longest-lasting results and can be permanent in some cases. You’ll have to go in for several treatments in order to treat the entire area, but compared to shaving or waxing again and again as it grows back, it’s still the best option you have today. If you’ve got sensitive skin there may not be a hair removal treatment available that will remove the hair and leave your skin unscathed. Most of the treatments involve agitating the skin to the point of causing pain and red splotches wherever it’s applied. This includes laser treatments, depilatory creams, and even shaving. Unfortunately, you’re going to have to do a bit of trial and error in order to find what causes a reaction to your skin and what leaves it alone. Going with products especially for sensitive skin is a good idea, but doesn’t guarantee you won’t have a reaction to it. The face is one of the hardest parts of the body to treat because it often requires precision, as well as something that won’t irritate the skin. This is the most visible part of the body, and gets the most attention so any redness left afterward is a sure sign that you’ve treated a hair problem. If you’ve got hair on your upper lip, this is one of the more embarrassing places to have it because it gives you that manly look, and is highly noticeable because when you talk people’s eyes tend to watch your lips move. A depilatory cream specifically for the face is the best way to go. Is Hair Removal Cream Bad for You? It’s never the healthiest idea to rub chemicals and other additives into your skin. The skin is the largest organ on your body and is the gatekeeper, keeping things out that shouldn’t come in, and releasing sweat and toxins that need to come out. While there may not be any immediate danger by using hair removal creams, it might not be good to get into the habit of using them repeatedly to remove your hair. Is Hair Removal Cream Better Than Shaving? Some methods, like laser removal, originally claimed to be permanent, but now most of them don’t go that far for risk or being sued. Most methods are not permanent, but can get your hair to the point where it grows back slower and slower, reducing the need to further treatments, and eventually can seem like permanent hair removal. Your goal here should be to pick the best method for hair removal that makes the most sense for what you want done. 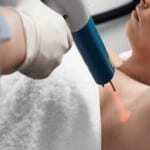 Laser treatments, while the most expensive and in many cases most effective way to go, are not always the answer. Also, there are at home laser devices that are proving they can provide salon caliber results at home. It’s interesting to note that you can either get your solution from a bottle, from a laser device, or from special gadgets designed to remove the hair painlessly and effortlessly. In the past they only had a few options, mostly just a razor. So even though we’re spoiled for choice in this modern world, there isn’t really one way to solve all of your hair removal needs, just use a combination of different methods to get the results you desire.